When we see what we are achieving as a Nation through our support of LNG Canada and the Coastal GasLink pipeline, we know our support has been well placed. Let’s put aside terms like “benefit agreements” for a moment, because that’s merely the medium for how we realize our success. 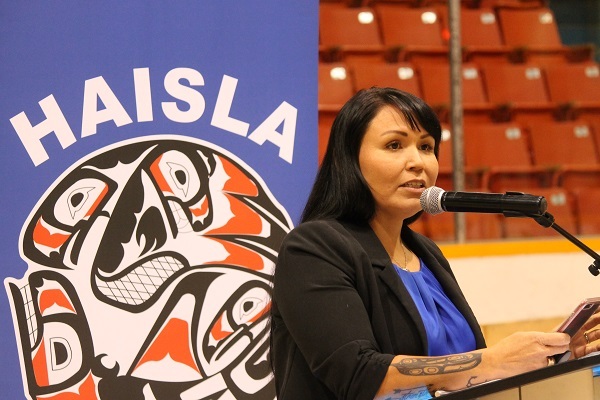 Chief Councillor Crystal Smith speaking to Haisla at an LNG celebration dinner. For now, let’s actually talk about the people. Just last week we hosted the first in a series of Haisla Christmas celebrations. In Vancouver, our Community Cultural Coordinator revealed a Haisla language words and phrases sheet, and she was met with loud applause for the effort she and her entire program have put in to revitalizing the Haisla culture. If it weren’t for the respectful and impactful negotiations and discussions we’ve had to date with LNG Canada and Coastal GasLink, she would not be there to offer that one extra tool, not to mention all the other work of the program, to maintain and enhance our community’s connection to our language. We have dedicated office space for our Education & Employment department, through which our Job Coaches, job placement coordinators, and more work towards giving our members access to jobs and the training they need to reach their goals. If it weren’t for the open communication and the continued offer of respect from LNG Canada and Coastal GasLink as they engaged with Haisla, we would not have those services in place. This land has been our home for thousands of years. The relationship between our Nation and industry has never been this healthy and open. Industry has come and gone from our Territory and not until now have we had this much influence in seeing it happen responsibly, and sustainably. What guides our decision-making is whether a project will make the right choices to maintain and enhance the environment, and whether the proponents will properly and effectively include Haisla people to enhance our quality of life. LNG Canada and Coastal GasLink have met our standards.